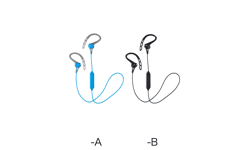 In ear sports headphones, running headphones HA-ECX20 • JVC U.K. The JVC HA-ECX20 sports headphones, sweatproof / splashproof (IPX2) are available in 5 fabulous colours. These comfortable sports headphones feature a “pivot motion clip” giving you the confidence that the running headphones will stay securely in ear. The ‘U-type’ cord and clip also keep the cord intact whilst on the move. Secure and comfortable fit with "Pivot Motion Fit"